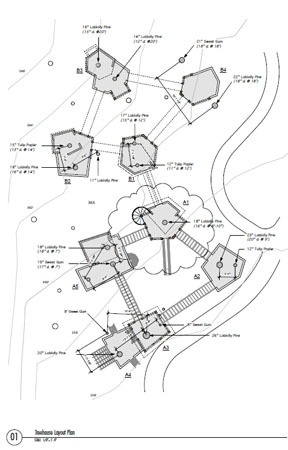 Nearly all commercial treehouses and many permitted residential treehouse projects will require a designated P.E. (professional engineer) or a R.A. (Registered Architect) to certify that the design is satisfactorily safe. However, if your project is small/medium, in a rural area with little regulation, or if you intend to build first and ask forgiveness later (no guarantees this will work for you), then you can skip this page and move on to our in house design/build process. We are not designated P.E.s or R.A.s, but for most average residential treehouse projects, people opt to trust our experience and judgement for everything from TAB selection and placement to lumber sourcing and finishing touches for smaller projects. Where do I find an engineer for a treehouse? There are 2 options. We can provide a referral to an engineer and architect that we have used. Some of these professionals have licenses nationwide. One of the most famous treehouse engineers out there is Charlie Greenwood and we have installed both his HL and XL series tree fasteners. The costs vary, but can be anything from $1000-3000 for a plan review or up to $8,000 and $20,000 for the full code preparation package for a large project. Prices will vary based on the project. All fees are paid directly to the architect or engineering company and you will be asked to sign an agreement with them at engagement. We are available to make site visits and engage in the concept design process whenever it is helpful. When engineering is completed, we can provide a construction proposal based on the final design. The second option is for you to find a local civil or structural engineer who is open minded enough to consider the project. In order to certify a project, the engineer will have to be comfortable enough with the tree attachment methods to put their name and reputation on the line. The problem is that there is very little public documentation for building and testing structures built in living trees, so it is going to take an engineer who is willing to take a risk or invest significant time into the design phase. Hopefully, they are well versed in the properties of wood and also the biology of trees. If your chosen engineer has any questions, we would like to describe the process to them and help them determine if they can take on the project.